Chick with Books: The Art of Devotion by Samantha Bruce-Benjamin... A Blog Tour & Review! The Art of Devotion by Samantha Bruce-Benjamin... A Blog Tour & Review! Author Samantha Bruce-Benjamin loves readers and would be happy to answer any questions you may have for her! Just ask away in the comment section! 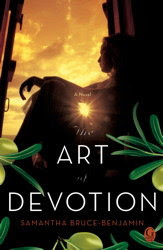 The Art of Devotion by Samantha Bruce-Benjamin is haunting... The prose is beautifully rendered on the page, like a love letter written to the reader... The women who fill the pages of The Art of Devotion struggle for your empathy as each reveals their hidden fears, betrayals, hopes and obsessions... and by the end of the story, their story, we are swept up into their lives. "For each of us, there is a moment: what we see at the last, before God closes our eyes forever; an entire existence distilled to one perfect memory. We anticipate its promise all our lives." The novel itself is unique in that the story is told from four points of view. Sophie, Adora, Miranda and Genevieve are the three generations of women that tell their story, unfolding it by alternating passages, almost like pages in a diary. At first I thought that having the four alternating narrators was just to establish the beginning of the story and the voices of the different women, but as the story continued that way, I found it an interesting way to read a story. Instead of having to guess the motivations of one of the other women involved in a particular circumstance, I was able to peek into their thoughts soon enough when it was their turn to "speak". The characters are fleshed out and well developed, and the empathy you will start to feel for them individually is the result of their lives coming to life on the page. Samantha Bruce-Benjamin does a wonderful job creating such strong believable women. And their lives are so entangled with one another too! There is more than one twist and turn to their stories. Secret liaisons and relationships are slowly revealed over the course of the novel, along with betrayals, that will having you devouring the pages for more! The setting for the novel is the beautiful Mediterranean, and the story has that carefree feeling to it. We are allowed to enjoy the women and not be concerned with the mundane of day-to-day living. The interactions between Sophie, Adora, Miranda and Genevieve are steeped in deep emotion, spanning 20 years of their lives, from young girls (in the case of Adora, Miranda and eventually Genevieve) to mature women, and the results are haunting. Even after finishing the book I am still thinking about those women and the choices they made. Not to give too much away, but the prologue meant so much more to me after I finished the book, and I would recommend going back and reading it again after you finish too! I would definitely recommend The Art of Devotion by Samantha Bruce-Benjamin! For it's beautiful writing, memorable characters and its intriguing story. And those 4 women were so interesting to get to know! About the Author... Samantha Bruce-Benjamin was born and raised in Edinburgh, Scotland, where she earned a Masters Degree in English Literature from the University of Edinburgh. A former BBC Editor, she began her editorial career at Random House. She now lives in New York. You can learn more about the author at her website Samantha Bruce-Benjamin.com. And you can grab The Art of Devotion reading group guide while you're there too! Would you like to ask Samantha a question or leave a comment for her? Samantha is happy to stop by and answer any comments or questions from readers! Just leave a comment and I'll let her know! I love the sound of this book; thanks for sharing your thoughts by way of this great review. Yes, the writing was lyrical, and it was so interesting how the story developed by way of the 4 narrators. Definitely a book to put on your TBR list!